Mongolians tend to be very understanding of the minor mistakes and breeches in etiquette foreigners make when visiting, viewing them as sources of humor rather than an insult. However, if you want to avoid being chuckled at or potentially angering someone, here are some tips. Use them along with good common sense and you should get along just fine. *Do not lean on the supports of a ger, or act disrespectfully toward the images or objects on the small altar invariably found in the rear (the most esteemed place) of gers. *Do not put food on the bed of a ger, as this is bad luck—it means you’ll be eating in bed for a long time (ie you’ll get sick). *Roll down your sleeves when shaking someone’s hand (if you know someone well you can just pretend to roll them down). Rolled up sleeves means you’re looking for a fight. *If your foot makes contact with someone else’s foot, or vice-versa, it’s tradition to shake that person’s hand. *When a Mongolian gives you food, they like to see you eat it. When a Mongolian gives you a drink, they like to see you drink it. This does not mean however that you cannot say ‘no thank you’. For example, you do not have to drink all the vodka which is habitually offered as a form of hospitality. Three shots is considered a perfectly acceptable place to stop, but if you think that’s pushing it, it’s OK to politely refuse. *Do not say anything negative about Chinggis Khan in social places, especially bars. 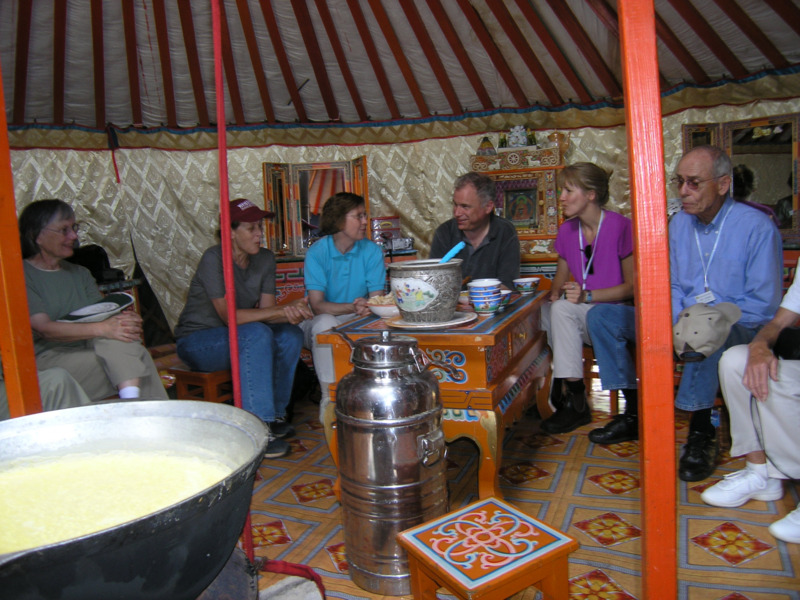 *Some Mongolian men do not like to see Mongolian women in the company of foreigners. While it is not a major problem most of the time, it can lead to disputes and even fights, particularly at discos. *Violent crime is not too common in Mongolia, but UB is a big city, so it’s best to be careful. Don’t walk alone late at night, for example. Petty theft is also on the rise, so watch your possessions closely. *Many of the city’s manholes do not have covers, so watch where you step. *During the winter, Ulaanbaatar’s streets can get very icy. Be careful for black ice and also tiles which get abnormally slippery. Many Mongolian women wear high-heel shoes year-round, regardless of the conditions. This is not advisable for someone unaccustomed to Mongolia’s streets and roads, regardless of the weather. *In many places, aines are not rigidly respected in Mongolia, so standing in a queue can be a frustrating experience. A combination of patience, restrained assertiveness, and a little bustling will eventually get you to the front.